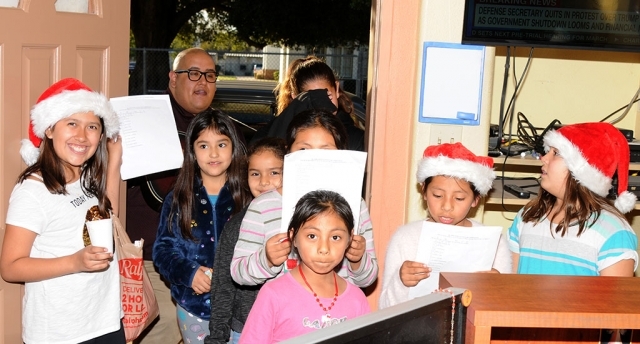 On Thursday, December 20th at about 3:30pm a group of Christmas carolers from the Boys and Girls Club stopped by the Fillmore Gazette and sang some classic Christmas songs for the entire office to enjoy. 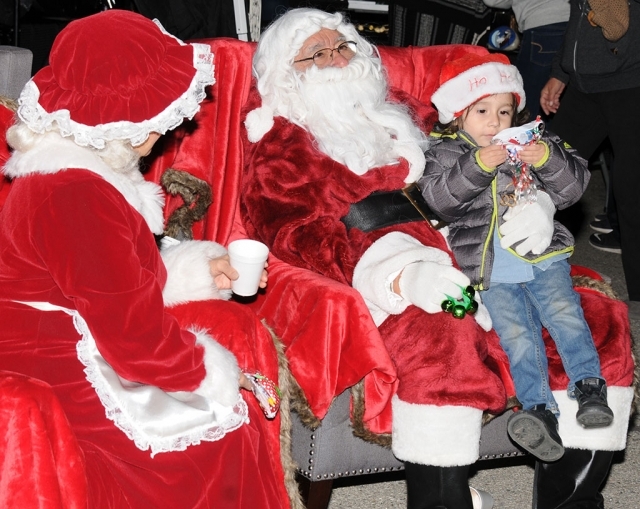 Their goal was to walk around to the local businesses and bring them Christmas cheer. 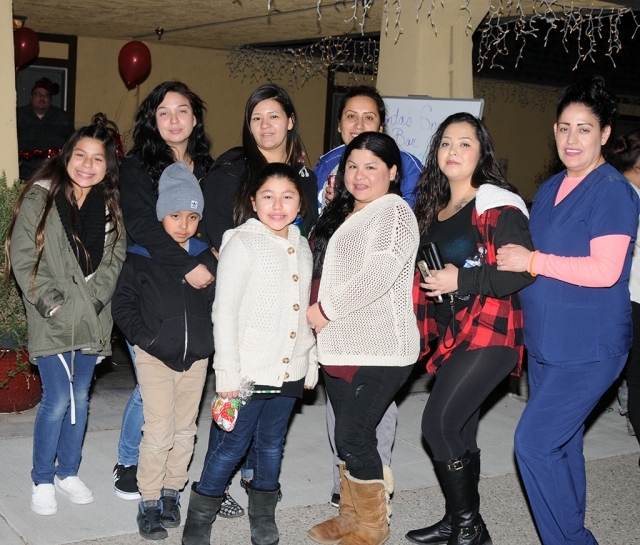 On Friday, December 14th at the Greenfield Care Center located at 118 B St. in Fillmore they hosted their Christmas Tree Lighting Ceremony. 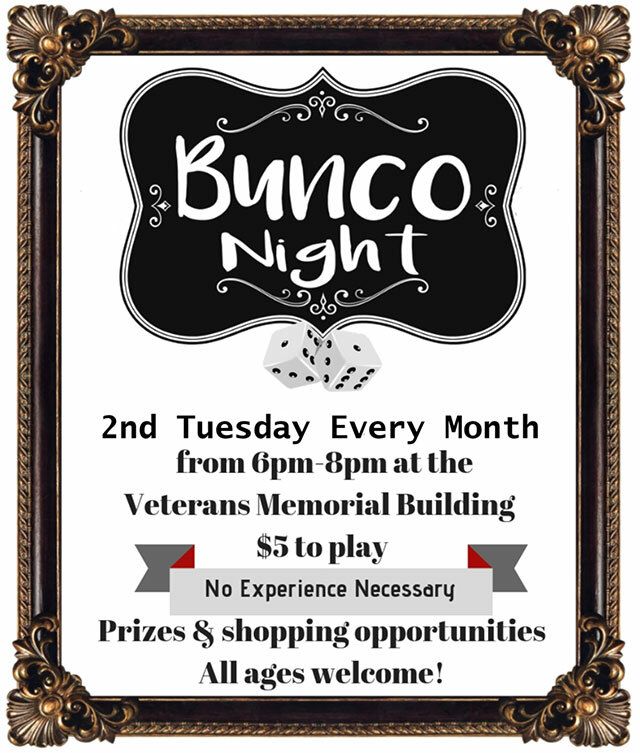 From 6pm – 9pm employees, their families and everyone from the community was welcomed to come and enjoy jolly jumpers, games, hot chocolate/ coffee, craft & food vendors, music and more. Even Santa & Mrs. Claus made an appearance. 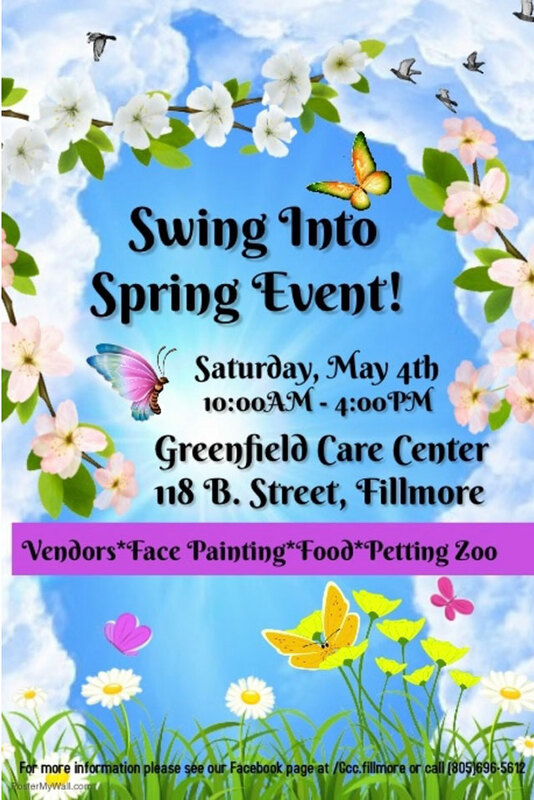 The event was hosted by the Fillmore Country Club & Greenfield Care Center. 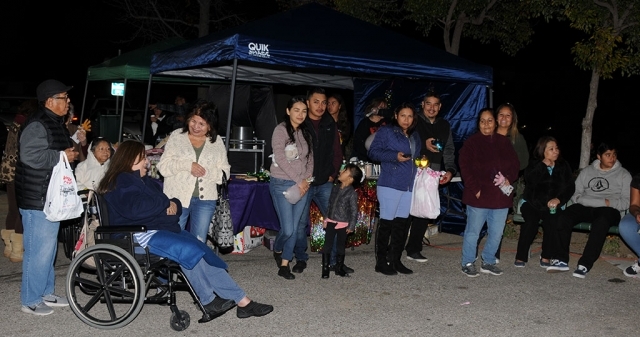 Pictured is some of Greenfield Care Center staff along with their kids enjoying the festivities. But walking down the street the other day I finally figured out what was bothering me then...as I passed the trees in our down town, each unique, most homemade, all put up with obvious joy...I realized what made ours different then the Sonoma production...our trees beauty came from our hearts, and to the hearts of our community! The only 'rules' for our tree tradition are no glass, no electricity, and no flocking- and if you can make the ornaments homemade all the better...but recycling is also honored! Then it is keeping your tree 'spruced up' until they come down around New Years. This tradition had never been about the money, only the heart. I talked to Marie Wren to get the history of the Christmas trees downtown and up until 1950 there were two giant trees put on both sides of downtown- right in the middle of the intersections. But then someone crashed into a tree, so after that the Chamber of Commerce started the trees down the side walks. Some time in the early 1970s they just disappeared. A few years back some friends were reminiscing at a FHS Alumni Banquet about 'the old days' and we wondered what happened to this tradition...so it was decided to get it up and going again. Every year it gets bigger and bigger in heart and in number of trees- so we hope to see more clubs, classrooms, churches and individuals participating next year! 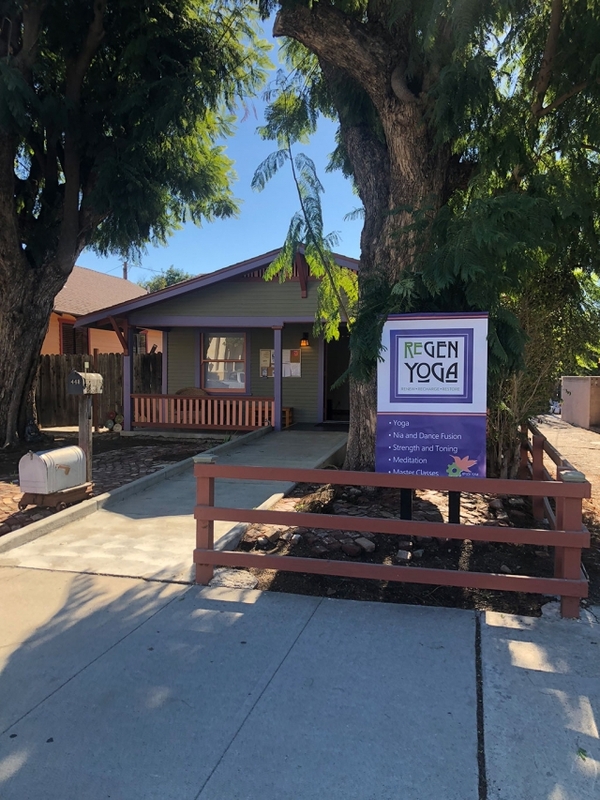 A special shout out to Moon Nursery in Piru, who loans us the trees, drops them off and picks them up too- we couldn't have done it without your generosity! 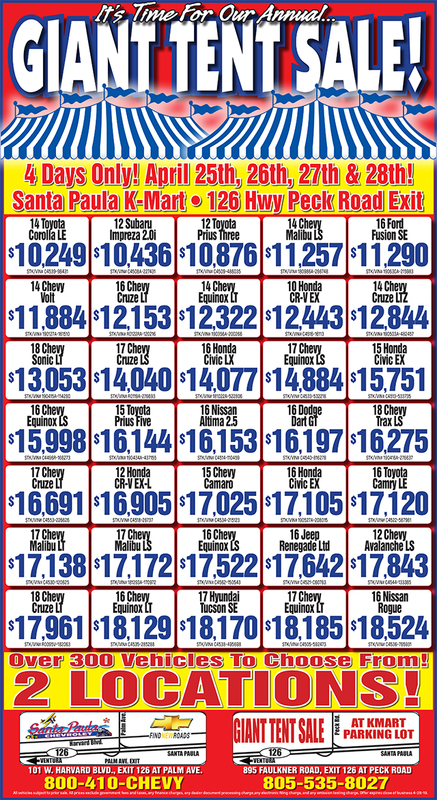 To Otto and Sons Nursery who is always there to help the details! And to Bank of Sierra who is always the first to take a tree, and also copies all the flyers for us. 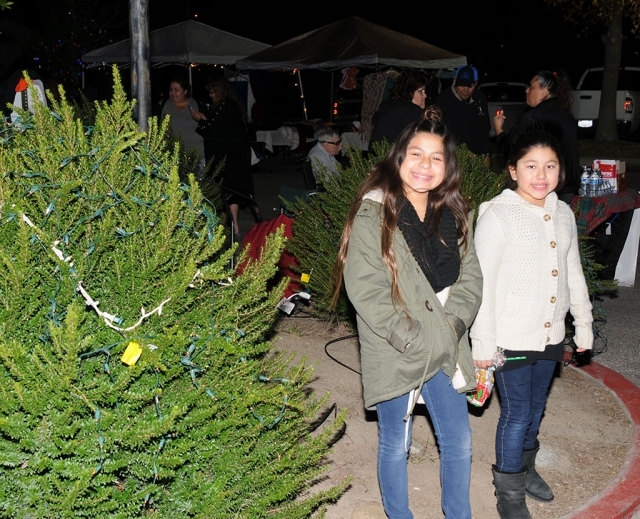 And to all of you who brought smiles to so many with a tree you decorated- you are why the community of Fillmore is so beloved! 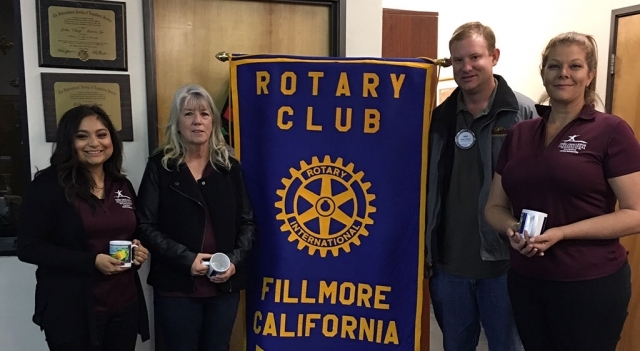 Teen Challenge presenters Katie, Director Rosie Weir and Ashley gave an informative program to Fillmore Rotary Club last week. 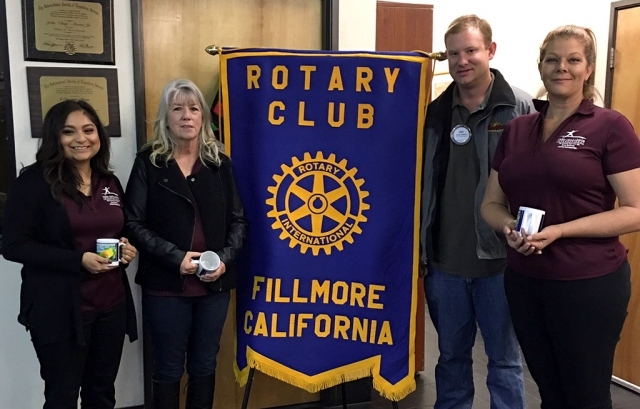 They are pictured with Rotary president Andy Klittich. 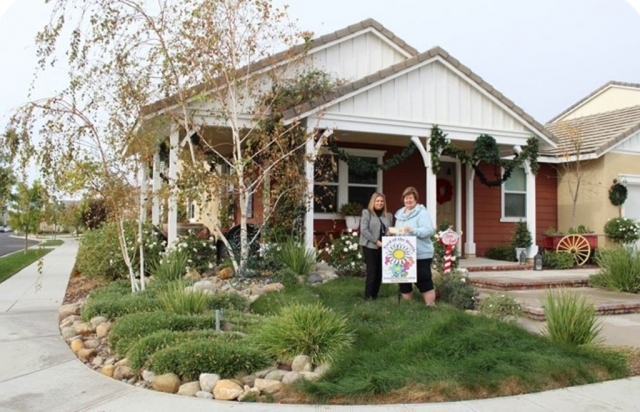 Teen Challenge is a one year residential program in Ventura for women 18 and up. 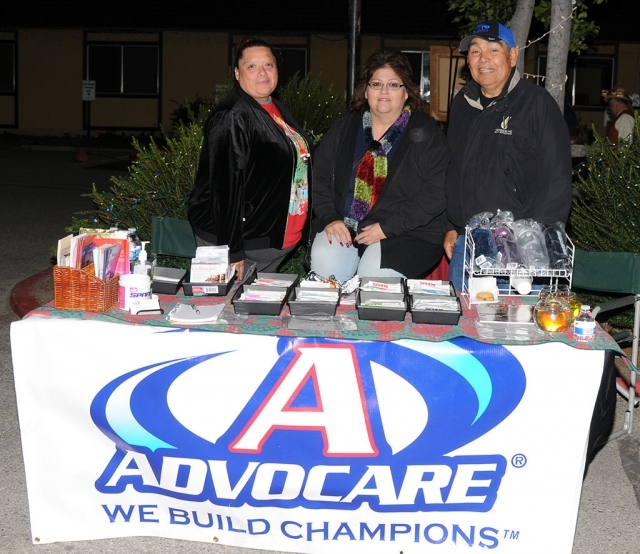 The program helps people become mentally sound, emotionally balanced, physically well and spiritually alive. Photo courtesy Martha Richardson. 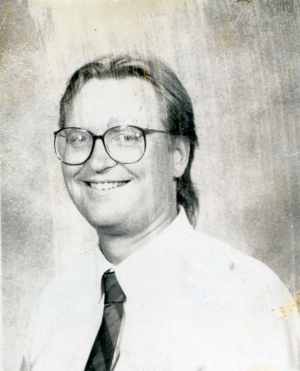 Joseph Kern passed away this past Tuesday, December 11. Among other things, he was a Fillmore attorney for more than 60 years, and City Attorney for 19 of those years. His public achievements were many. But Joe was also a personal friend to me, and a major reason for the Fillmore Gazette's success during the past 30 years. He defended us through a multitude of spuriously brought legal challenges and was always there when he was needed - which during the earlier years was frequently. He was always generous with his time and advice. Joe invited me to several special events at St. Thomas Aquinas College; most memorable, a speech by the late, great, Supreme Court Justice Antonin Scalia, and another visit by a celebrated expert on Dante's Divine Comedy. The former visit permitted me to take notes and write a short piece on Scalia's talk. Joe always seemed to have time to meet with me over some question, legal or otherwise, though I'm sure he had better things to occupy that time. An impatient person myself, I envied his patience. 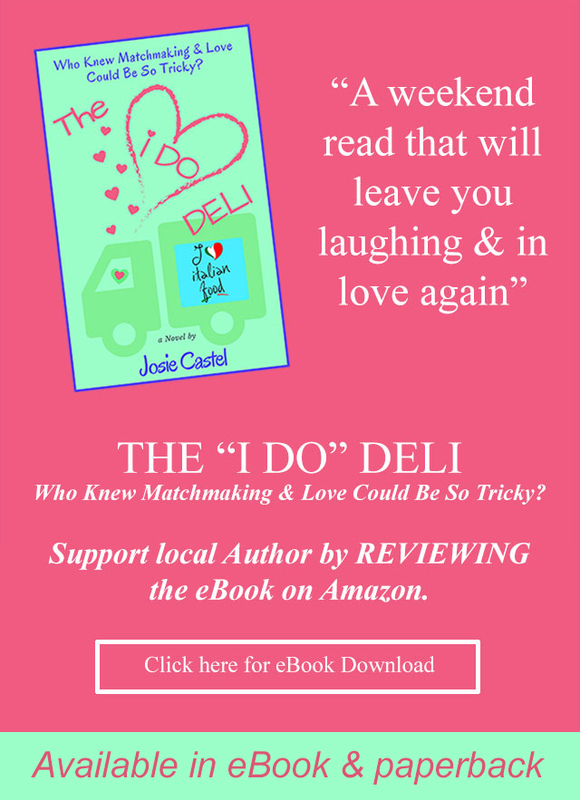 I remember one special, beautifully drafted legal document he prepared for me. He was a notably gifted legal draftsman as well. I will always remember Joseph Kern as a devout Catholic, trusted friend and confidant. Thank you Joe; may your soul rest in peace. 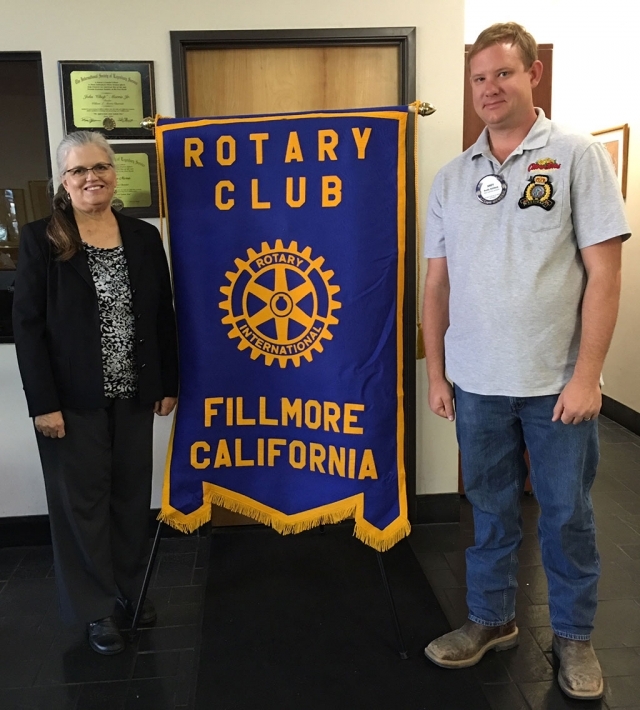 Fillmore Rotary Club donated $500 to the Fillmore Fire Foundation. 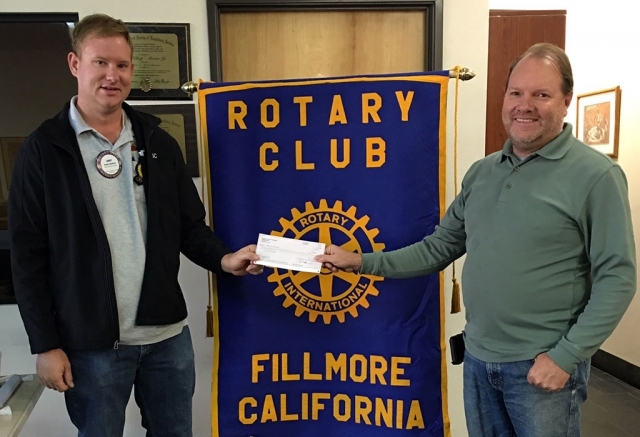 Scott Beylik accepted the check from Rotary president Andy Klittich. Photo courtesy Martha Richardson. 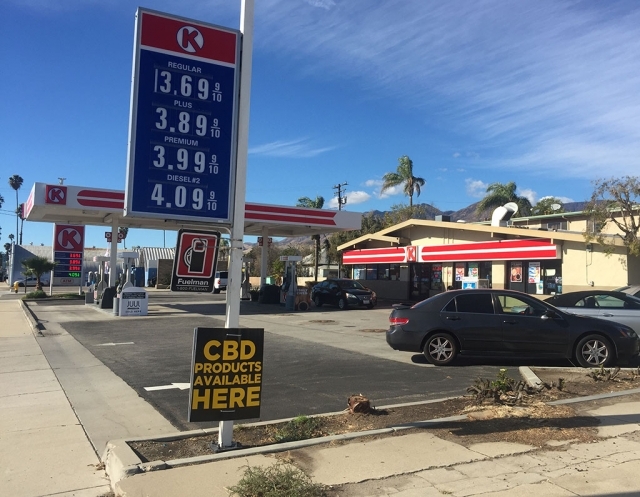 Circle K Gas & Market, located at 423 West Ventura Street, Fillmore, now offers CBD products. 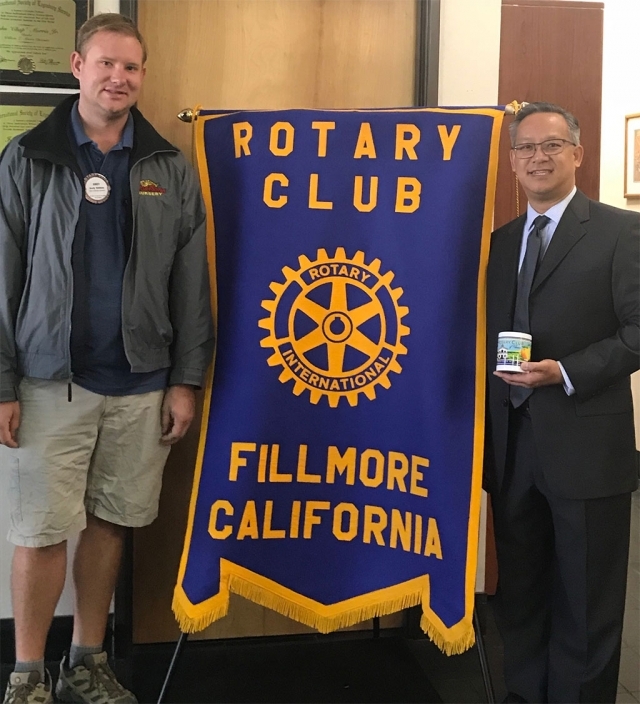 Rotary Club President Andy Klittich presented Dave Wareham with a special Paul Harris pin in recognition of his annual giving to the Rotary Foundation. 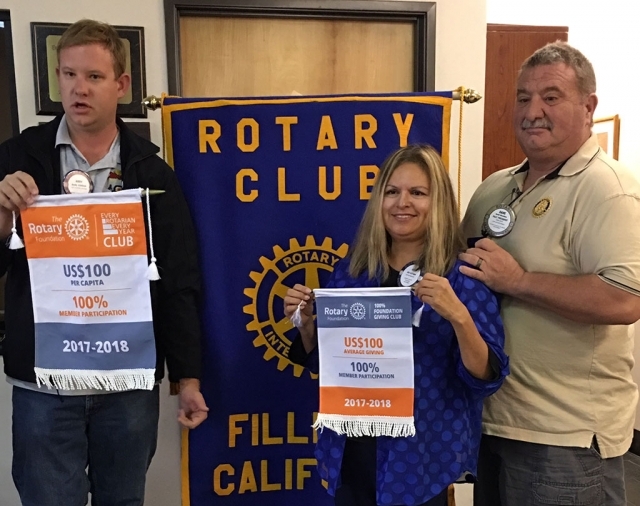 Andy and Ari Larson also presented the Club with two banners; one for 100% membership to ‘Every Rotarian Every Year’ which means every member donated $100, and the second ‘100% Foundation Giving Club 2017-2018’. Photo courtesy Martha Richardson. 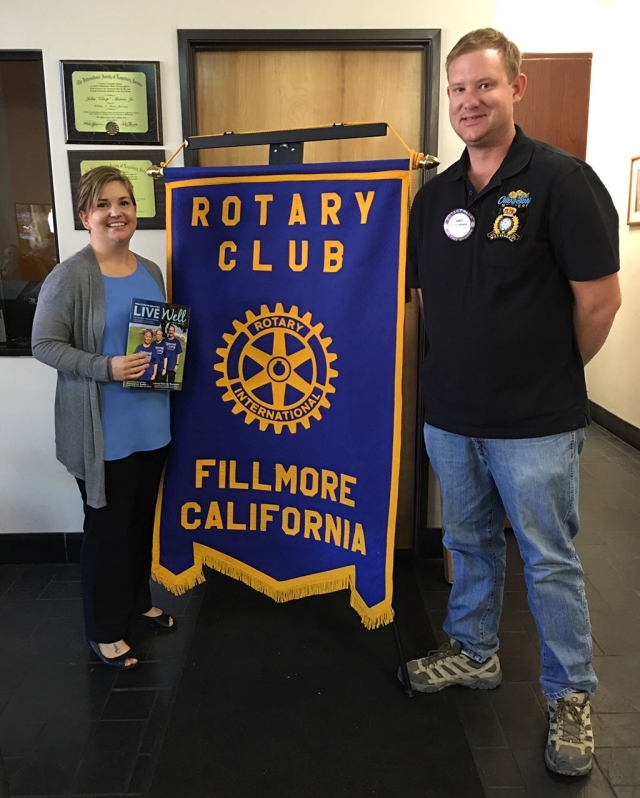 Karen Simpson presented a program on Camp HOPE to the Fillmore Rotary Club. 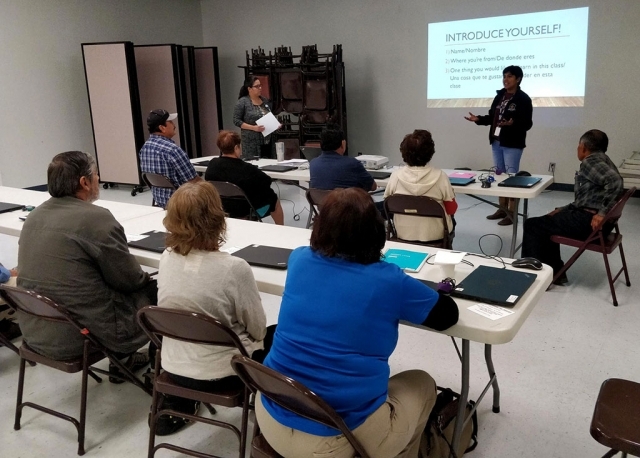 This program focuses on kids who have experienced, firsthand, domestic violence and other crimes in their homes. 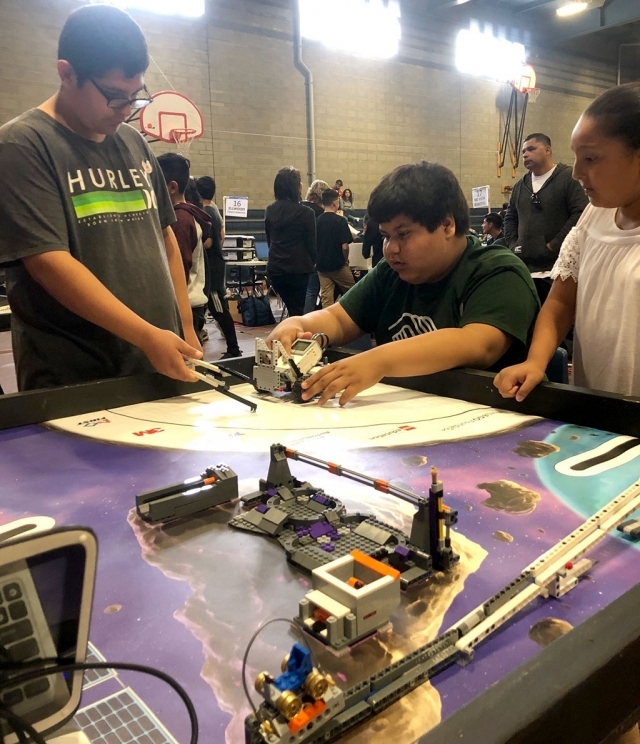 The main purpose of the camp is to give these kids their childhood back, by offering a fun, positive environment and helping them to find their future pathway. Photo courtesy Martha Richardson. 1,000 children at six schools for vision problems. Vision screening has been a part of Lions Clubs International’s mission since its founding and continues today. 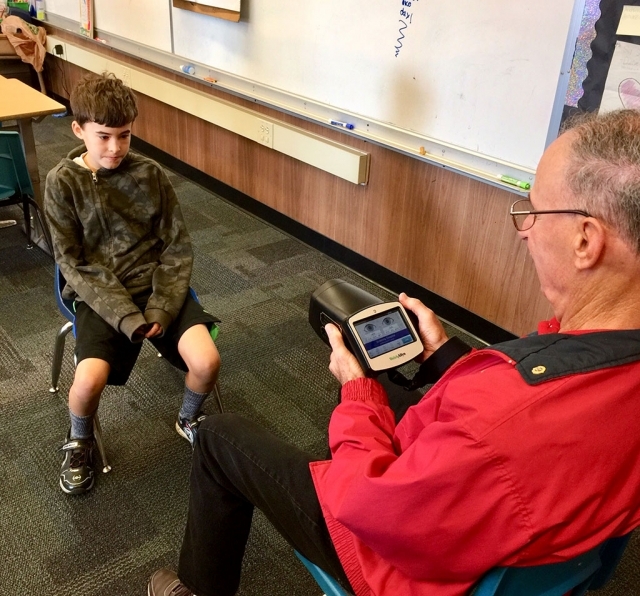 (Above) Pleasant Valley Club Past President Tom Debardas screens San Cayetano School student Casey Spore. Photo courtesy Brian Wilson. (l-r) Rotary President Andy Klittich with Deputy DA Brandon Ross, who presented a very informative and interesting program on Project LEAD, Legal Enrichment and Decision Making. Photo courtesy Andy Klittich. Deputy District Attorney Brandon Ross presented a very informative and interesting program on Project LEAD, Legal Enrichment and Decision Making. 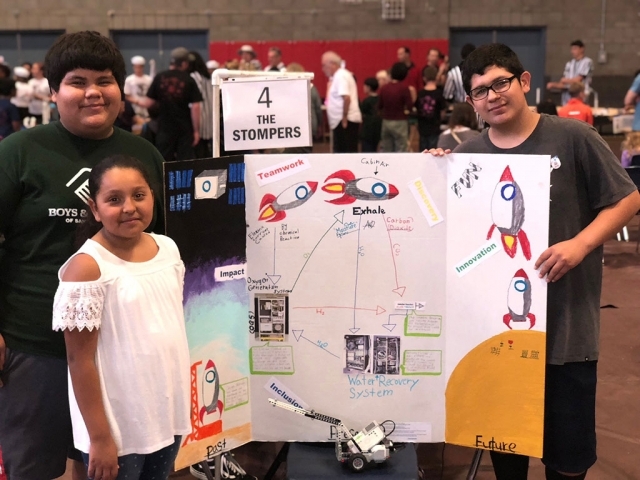 This project focuses on fifth graders and opens their eyes to what can happen if they make bad decisions and how their behavior can affect them legally. During the program they hear from a Judge, DA, Etc. and will travel to the Juvenile Justice Court where they participate in a Mock Trial. They also learn about electronic monitoring, and all aspects of what can happen with bad decisions. The hope is that this knowledge will filter into their lives and those of their families and friends.